Villa 'Casa blanca' is in beautiful grounds and set back from the road. We have a beautiful pool in the side garden, which is completely private and for your sole use.It is ideal for a peaceful private stay but also only 2 miles from both Cutrofiano and Collepasso. The coast is nearby, the closest beach being in Galipoli only 15 mins drive away. Other cities such as Otranto are a short distance from the villa, as are ancient caves, the tip of the boot, Santa Maria de Leuca and the baroque jewel Lecce. At the front of the property is a patio covered by a grapevine whilst the back citrus garden contains lemons, limes, oranges, figs and pomegranates. Behind the garden is a small olive grove. Our villa is modern but in a countryside setting. We have created an open space that retains privacy for our guests without feeling secluded. Bathroom with modern walk-in shower. Inside is modern furnished with a 42" Plasma TV, DVD player and Xbox. There are also a number of board games. Corner Sofa unit changes to become double sofa bed. Large double doors open to the front patio and there is an intercom operated gate system. Kitchen includes fridge/freezer, hob, cooker, washer dryer and all cooking equipment. Lecce Golf course as part of Hilton hotel is 30 mins from the villa. Property is suitable for wheelchair users as front doors widen and all rooms are on one floor. Notes on accommodation: Please let us know in advance if a high chair or cot is required. Outside: Front patio with grapevine covering, back patio in walled citrus garden. Private outside shower, BBQ, dining furniture at front with parasol, dining furniture at back with parasol. Extra parasol for beach provided. Cleaning / Towels / Linen / Maid service: Fresh towels, inc beach towels and linen are provided and included in the cost. Extra linen is provided during your stay. If further cleaning is required during your stay, please contact us. My husband and I booked this property as its location was perfect for our needs. We have travelled throughout most of Italy but had not been to the Salento and wanted to see the coastal towns and Lecce. 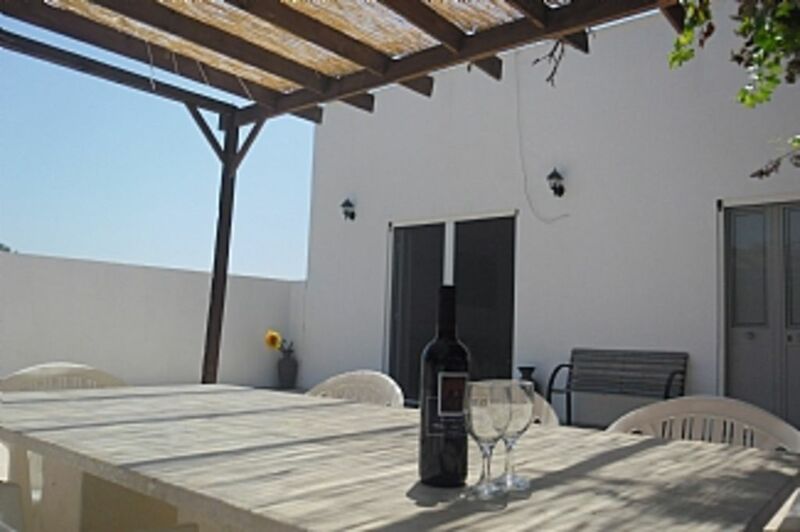 The villa is very spacious with a modern, well equipped kitchen. The pool was a real bonus and as we had very warm weather it was great to be able to swim each day. The large outside area is ideal for children as the villa is very secure and private. In a rural setting but with other properties nearby and on a back road which is used frequently by locals. This villa is excellent value for money. Thank you so much for your positive review, it is highly appreciated. We really take pride in ensuring our guests are extremely satisfied when they stay at our villa. We strive towards the goal that everyone that stays with us has just what they need for a perfect relaxing experience. The countryside setting is ideal for those looking for privacy, but still only a short distance from our local town of Cutrofiano. Hopefully you got a chance to use the bikes, it is a beautiful 3km cycle along the quiet road, surrounded by olive groves. Thanks again for the review, we would gladly welcome you back with the clear intention of achieving a full five star review next time! The second time and once again....What a fantastic location! The apartment was comfortable but we did not spend much time indoors as the garden was amazing with a fantastic pool and a great terrace where we barbecued fish and another great things. We were made to feel very welcome with a welcome starter package and a perfect bottle of wine. So for my wife, my daughter and me it was the second time that we stayed at the house of Rory. Now we could say that our first impression was the truth...the house, the location, the people, the food and the sea are a dream. Great location. Great pool. Great hammock. Great! We (I, my wife and our three kids - 5, 8 & 11) were so impressed with the size of the villa and surrounding grounds. Since it was at least 32 deg C everyday, the pool was a Godsend, We tended to spend the morning chilling at the pool and then explore a beach in the afternoon. We cooked a few times at the villa and ate outside under the pergola. The kitchen is small, but open plan and perfectly functional. There is a double sink, plenty of storage and oven. The fridge could be a bit bigger and the freezer didn't work that well, but not a huge deal. There is also a great BBQ, which we used a couple of times and, again, ate outside. A few pesky mozzies, but nothing Citronella and DEET couldn't sort. There are standing and ceiling fans in every room. No air con though. The hammock provided hours of wondeful (and rare!) relaxation time for the kids. Given its location, the villa is equidistant from S, W and E coasts, which all offer something very different. Our favourite place was Santa Maria di Lueca. Cutrofiano itself is a super little town. Pizza Mauro pizzeria and Dolce Arte gelataria are definitely worth a visit. Big hypermarket (Conad) not too far away plus plenty of local shops for essentials. The villa could do with a bit of TLC and could have perhaps been a bit cleaner for our arrival, but overall a great place to act as a base should you want to visit Puglia, which is highly recommended! Rory - in case you read this review, we had a brilliant time at your place. Thank you for your speedy replies to our messages and also the personal phone call when we first booked. If we could make one recommendation, it would be to install some overhead outdoor lighting above the table and cooking area such that using the BBQ and eating outside could be made even more enjoyable. Thank you for the review. We are really glad that you enjoyed your stay at our villa and have some excellent suggestions which we will action. At our countryside villa there is the possibility of some mosquitos outside, however all of our doors and windows have full netting, which keeps any bugs out and lets in lots of natural light. The villa has very high ceilings and we have lots of fans, which keep everyone fresh during the warm summer months. The local towns, cities and beaches are amazing and we are so happy that you enjoyed them, especially our local village of Cutrofiano. A basic open plan little villa, which proved to be perfect for two couples and two babies. The bedrooms are a generous size (easily fitted the travel cots and other baby paraphernalia) and the bathroom and kitchen are clean and modern. The living space is minimalist but was ideal for the kids to toddle around. Loved the outdoor eating space especially - lovely for a shady breakfast and evening drinks. The pool is also ideal for kids as it's raised, meaning it's very safe. It's a very quiet peaceful spot with hardly any traffic. Cutrofiano (nearest little town) is very pretty and highly recommended for dinner or a gelato in the square. It's only 20 mins from Galipolli which has a lovely historic centre and beautiful beaches. On the opposite coast Otranto was also gorgeous. The owner (Rory) is super helpful, as is the local contact Dave. I would definitely recommend this villa if you are looking for value for money. Hi Hilary, Thank you so much for the great review. We also love the simplicity of our villa. The pool very often provides a much needed dip at the end of a warm summers day. It is also completely private as surrounded by beautiful trees/ We fully agree with you on the charm of the nearby towns and cities, especially in their "centro storico". It would be a pleasure to have you and your family stay with us again. Villa is a little rough around the edges and could do with some updating with towels/decor/kitchenware and a good clean! Thank you for the review. We take great pride in the cleanliness and upkeep of the villa, which all previous reviews have reflected. We would love to welcome you back to improve on your experience. We can organise Italian cooking lessons on request. Only 15 minutes to the Ionian coast (Gallipoli) and 25 minutes to the Adriatic coast (Otranto). The Salento peninsula has the largest number of unspoilt beaches in Italy. 45 minutes from Brindisi airport (Ryanair from Stansted). 120 minutes from Bari airport (Ryanair from Stansted, BA from Gatwick). 3km from Cutrofiano, 3km from Collepasso, 18km from Gallipoli. Situated in Salento, the 'high heel of Italy’s boot', in the very south-east of the country, within the larger region of Puglia (or Apulia as it is sometimes called in English). Booking Notes: Deposit of 30% of the total cost of your holiday will be required to secure the reservation. Total cost should be paid no later than 8 weeks before start of your holiday. Upon receipt of full payment we will provide you with a comprehensive information pack containing local information, directions and contact numbers of people and services. A refundable security deposit of £150 is payable payable when total payment is due, to cover loss/non return of keys, damages, breakages or extra cleaning. Changeover Day: Flexible.